Roger Lee is a general partner at Battery Ventures. “Category kings,” defined as market-share leaders in particular business sectors, often wind up creating the majority of the market value relative to their competition. This advantage is particularly pronounced in technology: According to some research, more than 70 percent of the value created in technology markets is generated by the category’s king (think Amazon in retail, Facebook in social media, etc.). Our recent, more-detailed analysis around network effects found that they are, in many ways, more potent than many of us have thought: They lead to more efficient sales and marketing activity; create strong barriers to competition; and can lead to explosive growth as a category king’s base of users grows at a fast rate. Today there is a new class of prominent network-effect companies — such as Airbnb, Uber and Snapchat, all potential IPOs in the next 12 to 18 months (Snapchat’s parent has filed for its offering) — that have created and dominated enormous winner-take-most markets, including lodging and transportation. These companies’ success and increasing visibility prompted us to try to quantify the specific value of network effects in consumer-technology markets, particularly among category kings. One of our outputs is the new Battery Ventures Network Effect Index (available on our website). We believe the index and its related data hold insights to better understand the network-effect economy. What worked to create a network effect yesterday isn’t guaranteed to “kill it” tomorrow. The index is a market-cap weighted group of 36 current or previously publicly traded consumer-internet companies, each valued at $1 billion or more (as of December 31, 2016), whose business models can — in whole or in part — be attributed to network effects. As you can see from the chart below, the stocks of companies in the BNI have together risen by 161 percent and outperformed the S&P by 84 percent over the last five years, and outperformed the tech-heavy NASDAQ by 60 percent. This means that if you invested $1,000 in this basket of companies in 2011, you would have about $2,606 today. The combined value of all the companies in our index is $1.08 trillion, and the average time from founding to IPO was 8.0 years, compared to a broader average of 11 years for venture-backed companies. Using publicly available data from research firm CapitalIQ, we assembled the index to update dynamically each month. The numbers on the Y axis represent aggregate increase in market cap. Asterisked are past or present BV investments. Values denoted are public company market capitalizations as of December 31, 2016. HomeAway, OpenTable, Kayak and Trulia were previously public companies before being acquired, and values shown are acquisition values. 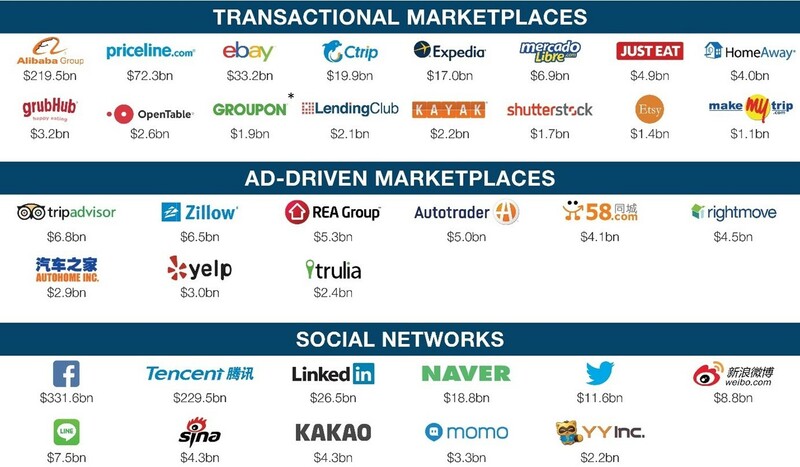 Transactional Marketplaces: Destinations where sellers and consumers meet to buy products or services. Examples here are travel site Priceline, food-delivery service GrubHub and Chinese e-commerce site Alibaba. Ad-Driven Marketplaces: These companies — like Zillow, Yelp and TripAdvisor — let consumers use the service for free, but try to get sellers (real estate agents, dry cleaners, hotels) to buy ads to fund the content. Social Networks: Prominent companies in this category include Facebook, Snapchat and WhatsApp. Below is a look at how the stocks of these three different types of network-effect companies have performed over the last five years. As expected, the social networks in the index performed exceedingly well, driven by the growth of companies like Facebook, Tencent, LinkedIn and others, increasing 254 percent over the five-year period. Interestingly, ad-driven marketplaces also performed well against the indices, and even relative to their transactional-marketplace counterparts. Ad-driven marketplaces beat the S&P 500 by 57 percent and even the tech-heavy NASDAQ by 32 percent, suggesting that their network effects enabled them to grow even in the public markets. Market size matters. According to our research, consumer transactional marketplaces generally can’t hit warp speed unless the total market they’re going after is worth $50 billion (yes, billion) or more. So while a $1 billion target market may sound great in a startup pitch deck, a much larger, $50 billion addressable market is what most companies in our index needed to create a consumer marketplace valued at $1 billion or more. That isn’t to say they didn’t start smaller in a niche market — HomeAway with vacation homes, OpenTable with restaurant reservations, Uber with black cars. However, as they grew, they moved into adjacent but related markets that could grow their TAM (total addressable market) to more than $50 billion. It’s important to note that the TAM rule is different for the three types of network-effect businesses. The social networks we studied generally operate in enormous markets in which demand for the service is almost limitless (as in all people). The ad-driven marketplace companies in our index, on the other hand, are going after relatively smaller advertising markets, which are often subsets of a broader transactional market. One way to unlock a huge market is to find a hidden “shadow market” existing in a corner of the economy. For example, online-review site Yelp operates in the market for restaurants, but can only command a small part of the revenue it drives, as it makes money by accepting advertising from local businesses and is not directly involved in actual transactions. Restaurant-meal delivery service GrubHub, on the other hand, takes a cut of all deliveries, which we believe is a better business model, as it’s sitting directly in the flow of a critical transaction. Thus, even though GrubHub is facing severe competition from many players while Yelp has a quasi-monopoly, the companies have similar market caps. High-performing and valuable businesses can still be built via an ad model — look at Zillow (real estate) and TripAdvisor (travel) — but these have to nail the consumer value proposition for massive categories. Tip: Find a “shadow market.” One way to unlock a huge market is to find a hidden “shadow market” existing in a corner of the economy. Both Airbnb and Uber are great examples of this. Who knew anyone with a spare bedroom could become a hotel, and anyone with a car could function as a taxi service? Essentially, these marketplaces unlocked new supply and demand and enabled almost-magical new behavior from consumers. Obviously, the companies in these sectors are now reaping the rewards. Though not included in our index, up-and-comers exemplifying this include Rover, which has unlocked a new supply of pet boarding, and Catalant, which is tapping a new supply of consultants. Companies serving smaller markets can still succeed — they may just need a winner-take-all monopoly to create multi-billion-dollar value. Just Eat, the GrubHub of the U.K. and Europe, and REA Group, the Zillow of Australia, are great examples of companies that have taken smaller markets and owned them to reach the throne. When figuring out a business model, carefully analyze supply and demand. To build a billion-dollar business, we think one key decision for executives of consumer marketplaces is deciding which side to charge for their service. In general, our research suggests that companies should levy a fee on the side of the transaction that is less constrained (either there are more of them in the marketplace, or the side that wants access to the service more). For example: Airbnb, valued at $30 billion, from the onset elected to charge consumers, not homeowners, because the consumers were the ones who desperately needed places to stay in busy cities with packed (and expensive) hotels. On the other hand, early market entrant HomeAway, which was valued at about $4 billion as of its acquisition by Expedia, charged homeowners to list their properties online. This could be one reason HomeAway didn’t capture more of the market, despite having first-mover advantage. Airbnb, meanwhile, captured much more housing inventory, and this allowed the company to offer a more compelling service. Sales and marketing spending is key. Finally, we believe there can be a relationship between sales-and-marketing spend and network effects among the companies in our index. Alibaba, a shining example of strong network effects, is worth $220 billion (as of December 31, 2016) and spends less than 15 percent of its revenues on sales and marketing. But childcare and elder-care marketplace Care.com, valued at $247 million as of December 31, 2016, spends more than 48 percent of its revenues on sales and marketing. Finding babysitters or elder-care is, after all, a relatively episodic need, and there is a high risk of disintermediation, yielding a marketplace with weaker network effects. As a result, Care.com needs to spend more on sales and marketing to maintain growth. Overall, we believe the network effect is more relevant than ever to future startup success. But the playbook is changing rapidly. What worked to create a network effect yesterday isn’t guaranteed to “kill it” tomorrow — and savvy entrepreneurs will have to work hard to keep up.